A healthy gastrointestinal system is the cornerstone of proper functioning of all the other systems in the body. By supporting the intestinal mucosal function and ability to digest and assimilate nutrients, we can optimize overall health. 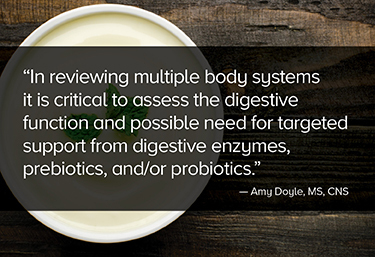 In reviewing multiple body systems it is critical to assess the digestive function and possible need for targeted support from digestive enzymes, prebiotics, and/or probiotics. The degradation of dietary carbohydrates, fats, and proteins is accomplished by the secretion of digestive enzymes from the intestinal brush border and the pancreas. The main enzymes responsible for the breakdown of these macronutrients are pepsin, pancreatic amylase, lipase, and protease. Insufficient production or secretion of these enzymes can lead to reduced gastrointestinal function and increased digestive complaints.1 Digestive enzymes are normally produced by the body whereas prebiotics are not produced by the body but rather ingested. Prebiotics are dietary fibers from carbohydrates that avoid absorption until they reach the colon where they are acted upon by colonic microbes, a fermentation process which is thought to promote health. * Prebiotics exist in a variety of complex carbohydrates including inulin, fructooligosaccharides (FOS), galactooligosaccharides (GOS,) and resistant starches. In addition to intestinal health, prebiotics have been shown to support satiety, insulin secretion, and cellular responsiveness. *6 G-protein coupled receptors for short-chain fatty acids have been found on enterocytes, leukoycytes, and enteroendocrine cells, giving SCFAs the ability to stimulate GLP-1 secretion. *2,7,8 Poor fiber intake can be found worldwide and among all age groups, with fiber intake barely averaging half of the Dietary Reference Intake(DRI).6 Even though most individuals may need to increase their fiber intake, an abrupt addition of large amounts of fiber-rich prebiotic foods can cause abdominal discomfort. As noted, prebiotics not only function to feed probiotics, they owe their name to this function. Prebiotics are of interest to both researchers and clinicians as choosing a prebiotic may offer selectivity or preference to the proliferation of certain probiotics. There are specific factors that suggest the need for digestive support with these therapies. * It is important to clarify the current experiences of the client. Also valuable to consider is the context of those experiences including variables such as history, timing, duration, and the effects on quality of life. Further assessments can include testing of breath, stool, blood, and occasionally urinary analytes. Oftentimes, the first assessment tools to determine the use of enzymes, prebiotics, and probiotics, are a quality interview and simple questionnaires. 1. Ianiro G, Pecere S, Giorgio V, Gasbarrini A, Cammarota G. . Digestive Enzyme Supplementation in Gastrointestinal Diseases. Current Drug Metabolism. 2016. 17:187-93. 2. Roberfroid M, Gibson GR, Hoyles L, McCartney AL, Rastall R, et al. Prebiotic effects: metabolic and health benefits. Br J Nutr. August 2010. 104. 2:S1-63. 3. Scholz-Ahrens KE, Ade P, Marten B, et al.. Prebiotics, Probiotics and Synbiotics Affect Mineral Absorption, Bone Mineral Content and Bone Structure. J Nutr.. March 2007. 137. 3 Suppl. 2:838S-46S. 4. Walker AW, Duncan SH, McWilliam Leitch EC, Child MW, Flint HJ. pH and Peptide Supply Can Radically Alter Bacterial Populations and Short-Chain Fatty Acid Ratios within Microbial Communities from the Human Colon. Applied and Environmental Biology. July 2005. p. 3692-700. 5. Niittynen L, Kajander K, Korpela R Galacto-oligosaccharides and bowel function. Scand J Food Nutr. June 2007. 51(2):62-6. 6. Jones JM. Dietary Fiber Future Directions: Integrating New Definitions and Findings to Inform Nutrition Research and Communication. Adv Nutr. Jan 1 2013. 4(1):8-15. 7. Saulnier DM, Ringel Y, Heyman MB, Foster JA, Bercik P, et al. The intestinal microbiome, probiotics and prebiotics in neurogastroenterology. Gut Microbes. January/February 2013. 4:1, 17-27. 8. Yoo J, Kim S. Probiotics and Prebiotics: Present Status and Future Perspectives on Metabolic Disorders. Nutrients. 2016. 8:173. 9. Doron S, Snydman DR. Risk and safety of probiotics. Clin Infect Dis. 2015 May 15;60 Suppl 2:S129-34.